We are spirit, soul and body. Arthur presents a model suggesting that our spiritual activity can compromise our healing our DNA. Cost includes 428 days of access after purchase date. The medical world today has struggled with genetic issues. We have the ability to document genetic problems and there are some data points about what causes the DNA to break down. However most of the triggers that cause the breakdown of DNA have not been identified by science. Arthur presents a possible link between our spirit, the world of fractals and our physical DNA. This model is unproven, but he gives you a solid starting point to be able to explore it further on your own. In the Holy Communion service, the focus is on the nature of our perspective of God. Most people acknowledge the existence of God. Many people worship God, but Arthur proposes a richer, deeper focus on the nature of God. The sheer power of truth in this live stream made my spirit ride high throughout. The section on the cherubim made my spirit leap, almost like a dance. The fractal of four teaching... wow. Unlocking truths that unlock healing, restoration. Wow. And I loved your incredible testimony on how worship has not only sustained you, but defied consequences of environment and age, literally feeding and seemingly changing your very DNA. How awesome is that!! Not just emotional, but real, verifiable truth. And truth was the power in all this. Loved this Scripture you declared, and all the others, and the elegant power of truth in this live stream. This was a deep taste for me that causes hunger for more – a definite need to re-listen and take in the truths again to soak it all up. All glory and honor to our God! And once again, thank you, Arthur, for your immensely big spirit and faithfulness. 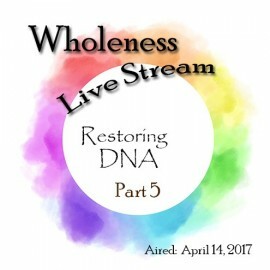 If you are expecting an extensive warfare session in this live stream for the restoration of DNA, you are in for a surprise. Instead Arthur went into great length to explore the topic based on biblical principles and encouraged us to walk out those principles in our lives. The topic was expounded with the fractal of four as the DNA is basically made up of four chemical bases. Arthur zoomed into the Scriptures to identify the spiritual representation of the fractal of four. My soul was speechless and my spirit couldn’t agree more when I learnt the truth about the purpose and the work of the cherubim in Ezekiel and the four living creatures in Revelation. God is trying so hard to tell us something profound through the broken structure in our DNA!!! Have we been overtly giving praise to God? Have we been passionate about God’s glory? Have we been defiant in defending God’s honor? At the end of the day it’s all about God and not about our pain and compassion. Praise and glory and honor, worthy is the Lamb to receive! What is the condition of your DNA? Nobody can answer this question for themselves. Yet our DNA affects just about everything. This teaching will enlarge your view of your DNA. It will also reduce your sense of powerlessness.